The modular building manufacturer have successfully completed a rebrand of their company and the new TGS 26.500 makes a great addition to the recently updated fleet. 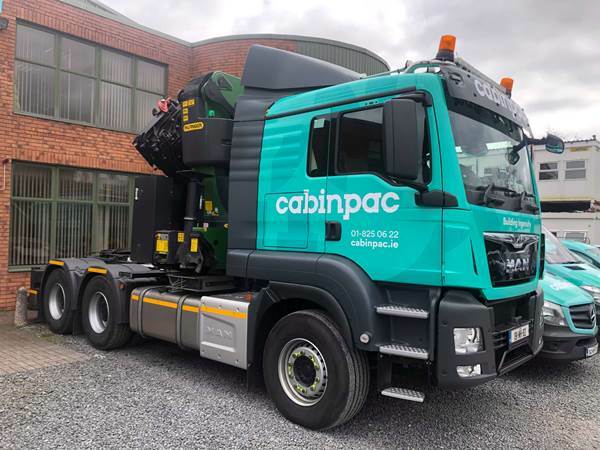 Cabinpac located in Dunshaughlin Business Park, Co. Meath say, “The new brand identity has given a forward‐looking, energized persona, and we are certain it will further elevate us to achieve partnership status in the eyes of our clients, as we aspire to continue to bring value to and serve their ever‐evolving needs”. The new MAN TGS 26.500 is a 6x4 Double Drive with a 500HP 12.4 litre engine, Tipmatic (c) Gearbox, equipped with a Palfinger PK76002 76 tonne crane.